(Newser) – Salon calls it "one of the harshest covers about Donald Trump yet," and the Boston Globe says it's "stunning" but "not in a good way." The cover for the new issue of Newsweek—on newsstands Aug. 11—depicts President Trump in a recliner and surrounded by junk food (some of which didn't make it all the way to his mouth). He's got his phone and a remote with him. 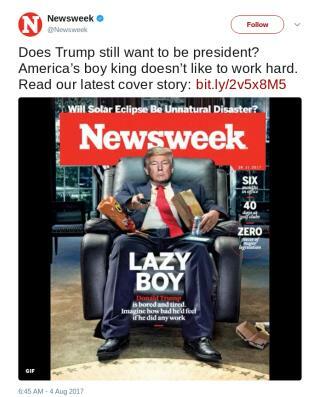 The text reads: "LAZY BOY: Donald Trump is bored and tired. Imagine how bad he'd feel if he did any work." The cover also highlights Trump's 40 days at golf clubs and zero pieces of major legislation. I guess NEWSWEAK forgot to give this in their story of PREZ TRUMP! But PREZ TRUMP has done way more in MONTHS than Ex-Prez Obama did!! By reducing 800 regulations adding Every job sector was up. The stock market is up almost 4000 points all tied to it without putting Q123, Obama added 4 trillion in debt to stock market. Now Trumps economy has added 4 trillion. He has cut debt already 350 B. Obama doubled the debt with 1 president. More than all the first 43 combined. Factory after Factory building to add jobs by this. He passed 8 bills. Fixing VA, Deported 3,000 MS13 criminals. The illegalborder crossings down 70%. Food stamp use down 4%. Tripled under obama. Shall I go on to those that are UNINTELLIGENT & UNEDUCATED (& U know who UR). Prez Trump gave up money and his life to help America. We are lucky to have him. Have a nice day & There ya go ALL! PREZ TRUMP for 8 YEARS#MAGA THEN PREZ PENCE For 8 YEARS! & The GOP in Control of the House,Senate & The SCOTUS for a LONNNNGGG TIME!.